Led by researchers at the Department of Energy's Lawrence Berkeley National Laboratory (Berkeley Lab), the project is described in a paper published this week in the journal Nature Materials. "In order for an artificial photosystem to be viable, we need to be able to make it once, deploy it, and have it last for 20 or more years without repairing it," said study principal investigator Ian Sharp, head of materials integration and interface science research at JCAP. "Good protection layers are dense and chemically inactive. That is completely at odds with the characteristics of an efficient catalyst, which helps to split water to store the energy of light in chemical bonds," said Sharp, who is also a staff scientist at Berkeley Lab's Chemical Sciences Division. "The most efficient catalysts tend to be permeable and easily transform from one phase to another. These types of materials would usually be considered poor choices for protecting electronic components." "This gets into the key aspects of our work," said study lead author Jinhui Yang, who conducted the work as a postdoctoral researcher at JCAP. "We set out to turn the catalyst into a protective coating that balances these competing properties." "This technique gave us the level of precision we needed to create the composite film," said Yang. "We were able to engineer a very thin layer to protect the sensitive semiconductor, then atomically join another active layer to carry out the catalytic reactions, all in a single process." "The design of this composite coating was inspired by recent advances in the field that have revealed how water-splitting reactions occur, at the atomic scale, on materials. In this way, mechanistic insights guide how to make systems that have the functional properties we need," said Sharp. 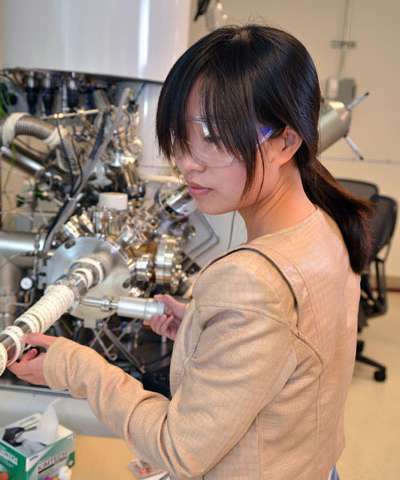 "A major impact of this work is to demonstrate the value of designing catalysts for integration with semiconductors," said Yang. "Using a combination of spectroscopic and electrochemical methods, we showed that these films can be made compact and continuous at the nanometer scale, thus minimizing parasitic light absorption when integrated on top of photoactive semiconductors." "In general, we need to know more about how these systems fail so we can identify areas to target for future improvement," said Sharp. "Understanding degradation is an important avenue to making something that is stable for decades." multi-layers for capturing as much of the energy as possible! Just another reminder that since plant leafs do incorporate a protection scheme against damage from UV light, that it takes intelligence to make it so. That therefore clearly points to the absurdity of expecting that the highly complex process of photosynthesis could have happened by chance. Clearly life was created by a superbly genius of intellect. To think otherwise would be the same as saying the IBM PC arose all by itself out of scrap metal in a tornado.